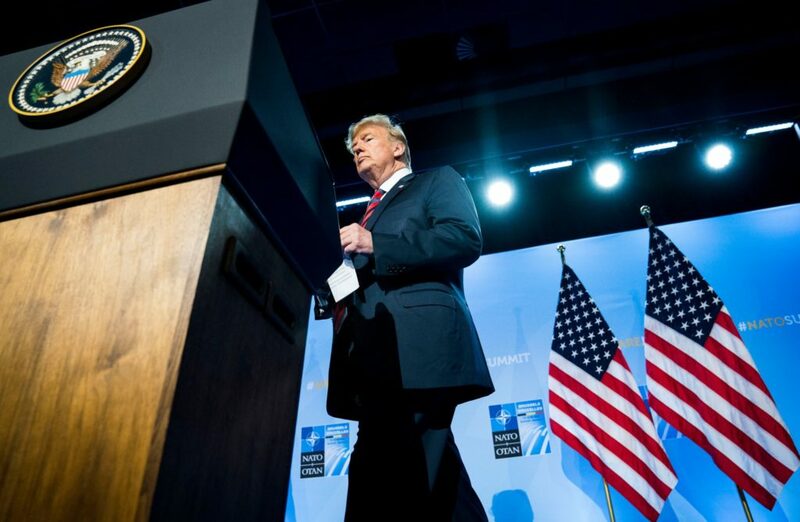 BRUSSELS — European allies knew to expect the unexpected from President Trump, especially after their rancorous encounter last month at the Group of 7 summit meeting in Canada. But Mr. Trump’s European tour has still rattled many on the Continent and in Britain, who have watched from a distance the chaos he creates on a daily basis in the United States but had not been directly exposed to it until this week. More important, for the long term, they have begun to believe that underneath the presidential narcissism, sarcasm and bluster there is a strategy: to undercut European solidarity in NATO and the European Union so the United States can exercise its economic and military power to shape relations with individual countries, just as China and Russia seek to do. The atmospherics have been awful. Mr. Trump happily broke protocol at NATO and in Britain, skipping appointments with other leaders, forcing changes in the agenda, scolding other leaders, calling an early news conference to get onto morning television programs in America, making unfounded claims about agreements and giving an interview to the British mass-market tabloid The Sun that deeply embarrassed his host, Prime Minister Theresa May. The frustration sometimes comes out in meetings. At the NATO meeting, for instance, Prime Minister Lars Lokke Rasmussen of Denmark told Mr. Trump that Danes had suffered as many casualties per capita as the United States had in Afghanistan, and that blood mattered more than money. “In direct and clear speech, I have made it clear to him that Denmark’s contribution cannot be measured in money,” Mr. Rasmussen said afterward. The personal distaste could also be measured in body language, when European leaders made little effort to engage with Mr. Trump, chatting to one another while Mr. Trump walked along with the Turkish president, Recep Tayyip Erdogan, a semiauthoritarian outsider. They are also fearful of his populism, his support for Britain’s withdrawal from the European Union, or Brexit, and his affinity with their political adversaries, who share his nationalist, anti-immigration message. How to do that, however, is less clear, since Europe’s security dependence on the United States is both obvious and will not change soon, despite European talk of more money for a joint European defense. The problem is visible not just in Germany but in Spain, distant from Russia. Pedro Sánchez, Spain’s new Socialist prime minister, outraged the leftist lawmakers who helped put him in office when he pledged to raise his country’s military spending to 2 percent from the current 0.9 percent of the country’s gross domestic product. “It cannot formulate self-confident and achievable goals,” Mr. Kornblum continued, “and above all seems unable to stand up for itself against the criminals of the world” — including the former Serbian leader Slobodan Milosevic in the 1990s and President Vladimir V. Putin of Russia now. The European nations’ great accomplishments — continental peace and social welfare — have led them “to become self-righteous in their pride about them, but in reality these steps forward were only possible within an American bubble,” Mr. Kornblum said. And now Mr. Trump has called them out on it and “spoken the unspeakable,” Mr. Kornblum said, and it is both unwelcome and uncomfortable. If nothing else, Mr. Trump’s apparent willingness to turn over the table has gotten the attention of Western allies, creating a sense of urgency to meet the spending goals, and not everyone drew back in alarm. But the big question is whether any amount of spending would actually satisfy Mr. Trump, or whether his real attempt is to divide NATO and the European Union, both Mr. Heisbourg and Mr. Valasek said. Mr. Trump mixes his threats about more trade tariffs if the European Union does not come to better terms with his threat to withhold security from those same countries. Of course, Mr. Trump also uses and misuses the figures he chooses. He often says that the United States pays for 90 percent of NATO, or sometimes he says 70 percent, when the figure is really about 67 percent, and includes the percentage of global military spending. In fact, according to the International Institute for Strategic Studies, of the $603 billion the United States spends on defense, only about $31 billion goes to Europe. That number is increasing. But the European countries of NATO are spending about $239 billion and rising, even if their spending is not very efficient or coordinated. Similarly, Mr. Trump likes to cite a $151 billion trade deficit with the European Union. But that figure is for goods only — not for services,which represent nearly 80 percent of the economy, where the United States has a small trade surplus with Europe. For Mr. Heisbourg, Mr. Trump the businessman is simply “monetizing American power.” As Mr. Trump recently said, he regarded the European Union “possibly as bad as China, just smaller.” He sees Germany as dominating the bloc, and Germany, for which he has a special animus, as “the weak link in an organization vulnerable to linkage between trade and security,” Mr. Heisbourg said.